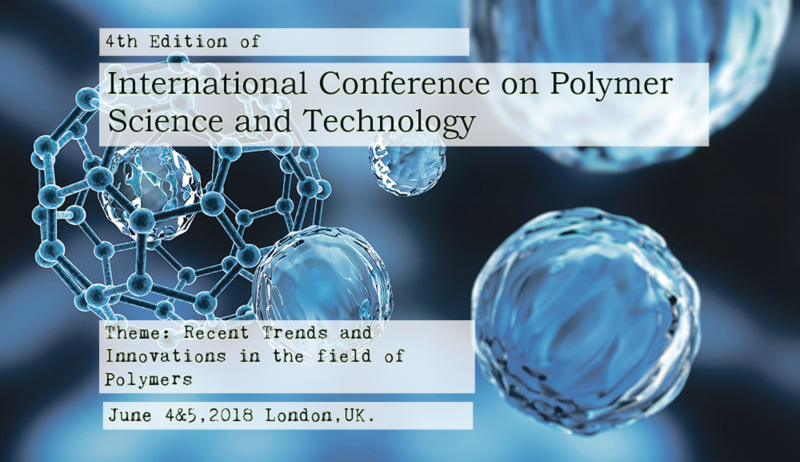 We are pleased to announce "4th Edition of international conference on Polymer Science and Technology", scheduled from Jun 04-05, 2018 at London, UK. Euroscicon Ltd invites all the participants from all over the world to attend International conference on Polymer Science and Technology 2018 during Jun 4-5, 2018 in London, UK, which includes prompt keynote presentations, Oral Talks, Poster Presentations and Exhibitions. On this great gathering, Organizing Committee invites participants from all over the globe to take part in this annual conference with the theme. Polymer Congress 2018 aims at sharing new ideas and new technologies amongst the professionals, industrialists and students from research areas of Polymer Science, Nanotechnology, Chemistry and Physics to share their recent innovations and applications in various fields and indulge in interactive discussions and technical sessions at the event. The Conference will also have a space for companies and/or institutions to present their services, products, innovations and research results. Polymer science and engineering involves the tracks like Polymer Nanotechnology, Industrial applications, Polymer Chemistry, Biodegradable Polymers, Composite Polymer, Advanced polymer Structures, Modeling/Simulations of Polymers, Role of Polymers in biology and biological systems, Polymer Physics, Applications of Polymer materials.